I'm Ashley, a horse crazy girl. People ask me, 'Why do you ride?' And what is my answer? I say to them, 'I ride for the love of horses.' 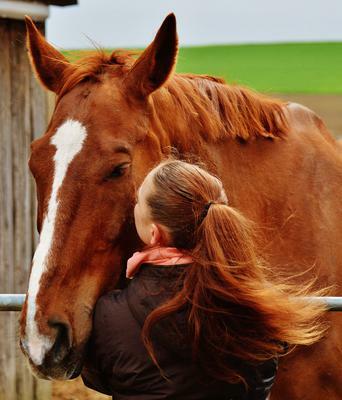 Here is why it's for the love of horses. "Mom? Do you think he is doing alright?" Ashley asked her mom as the drove down the rode. "Yes, Ashley. Of course he is! He is a well-trained horse!" Mom answered. "But, you know this is MY first horse. Not yours. I am just worried on how it will go!" Ashley said as she stared out the window. It was quiet and peaceful outside. Just then, it wasn't quiet and peaceful. It was loud and painful. Ashley woke up in a hospital bed. "What happened? Mom? Anybody?" Ashley mumbled. "I think she's awake." Ashley heard some people say. Whoever it was that said that, came up to her bedside and said, "You are going to be okay. You're mother is not doing well though. Just stay laying down for a while." "What happened?" Ashley asked. "You were in a serious accident. You're mother got the worst of it. But she is going to be fine. Lay back down now." The nurse explained to her. "My horse!! What about Stormy?!" Ashley suddenly sat up and said. "He is fine too. He's at your home right now." The nurse said before walking out of the room. Soon Ashley could leave the hospital. "Can my mom leave too?" Ashley said as she stood up. "No, she will have to stay for a while yet." The nurse said as the two walked out of the room together. "Well then, who will be bringing me home?" Ashley asked the nurse. "Your dad's friend and his son. They called ahead of time so it's all worked out." The nurse told her as they went down the hall, and out the door. Ashley walked out and saw them waiting. "Oh no." She thought. "Not Derek." Derek is the guy that Ashley has had a crush on for a while now and she could tell that he liked her too. And she was going to be riding in a truck with no back seats. Ashley smiled to the nurse and walked up to the truck and put her stuff in. "I think that I'll just sit in the back." Ashley said to her dad's friend. "Sorry, we don't have a back seat in here, Ashley." He replied. "No, no. I meant I would sit in the way back." Ashley corrected. "Okay! Suit yourself!" He said as he got into the truck. Derek and Ashley DID talk sometimes, it's just a bit awkward when they do. They have been on trail rides and stuff before, it's just that now they're older, it is a LITTLE bit different. Once they got to Ashley's house, she jumped out of the truck, got her stuff, said thank you, and ran inside. As she was going in, she ran into her dad who was just walking out the door. "Not so fast Ashley. Derek is staying here for a couple weeks." Dad said. "What?! Why?! "Ashley said confused. "His dad is going to Hawaii for him and his wife's anniversary! And Derek has to stay here." Dad explained. "And you will have to show him what to do here on the horse farm." "Oh for the love of horses! Why does he have to stay HERE though?" Ashley asked. She looked back and saw Derek laughing at her quote, 'For the love of horses!' Ashley says that instead of 'For goodness sake!' or 'Oh my gosh!' "Always laughing at that!" Ashley said to herself with a little laugh. NEXT PARTS IN THE COMMENTS SECTION! Cool story, love to hear more! Could you make a story from the horses' point of view? I would love it! Hey horse girls! I just wanted to say that I will not continue this series much longer. But I would enjoy getting some ideas for a different horse story!! Please tell me your ideas in the comments...Thanks! Really great story! Write part 4! Ashley was just riding but then Stormy was startled by a car pulling into their driveway. Stormy ran as fast as he could and jumped over the fence. Ashley was trying to stop him but she couldn't. She held on to the horn of the saddle the best she could. She had dropped the reins while going over the fence. "Hang on, Ashley!" Her dad called. Soon Ashley's dad and Derek were both tacked up and ready to chase after this runaway horse. Ashley just waited as the startled horse kept running. Soon, Stormy settled down a bit. But with Dad and Derek approaching on their horses, Stormy decided to bolt again. "No Stormy!" Ashley said before she fell to the ground. Ashley fell on her side and winced. She saw Stormy stop and turn around. Ashley was confused. Soon, her dad and Derek came riding up next to her. Derek got off of his horse first. Then he said while reaching his arm out, "Are you okay, Ashley?" "I think..." Ashley said as she took his arm and he pulled her up. Then she saw Stormy come towards her. "Hey, boy. I know you just got a bit scared. It's okay." She said as she walked closer to him. She patted him on the shoulder and was about to get back on when her dad said, "No, Ashley. I'll be riding him back, Not you." She turned to him and said, "But Dad! He just got startled by the car--wait,who was that even?" "I really don't know. I should go and see. You can ride Stormy only if you're with someone that I trust. So Derek?" Dad said as he mounted onto his horse. "Will do." Derek said while glancing at Ashley. She rolled her eyes and said, "Even though I CAN handle him." "Ashley. Obviously you can't." Dad said before he rode off. Ashley then got on Stormy and the two rode off to home. They reached the barn and Ashley dismounted and said, "I have to go see mom now." Derek looked at her and said, "He's not taking you." Ashley smiled and said, "Then you will." She then started walking to his truck. She got in and said, "Come on! Let's get going!" He smiled and ran over. Soon they were driving off to the hospital. Once they got there,Ashley ran inside and asked to see her mom. She went into the room where she was and said, "Hey mom. Are you feeling any better?" "Yes, I feel a lot better now, thank you. Where's your dad?" Mom replied. "He didn't come. Derek brought me instead." Ashley answered. "Well how is Stormy doing?" Mom asked. "He was doing well, but then he got spooked and ran off while I was on him. He finally calmed down though." Ashley replied. Then Ashley heard a car honk. "I have to go. Bye Mom! Love you!" Ashley said while exiting the room. Then she thought of something, "Stormy would be a good horse for jumping..."
I want a pt 3! When is it? "He will be working here on the farm too, okay?" Ashley's dad added once she passed him. Ashley swung her head around and said, "Okay... but where is he going to stay?" "In the guest bedroom of course! So please go show him to his room." Dad said. Ashley was about to walk away when dad added, "Ashley, I know that you don't want him to stay here but just have a good attitude for me please." "Okay dad." Ashley replied with a slight sigh. Once she got back over to the truck, Derek's dad came over to Ashley's dad and started talking. She came up to Derek and said, "You will be staying in the guest bedroom and dad told me to take you there. So just follow me." Ashley told him while helping him carry his luggage to the house. After they made it to the house and up the stairs, Ashley stopped at the guest bedroom. "Here it is!" She said and opened the door. Derek nodded and said, "Thanks." He looked over and saw Ashley walk to her room and realized that it was only the next room down. She looked back to him and said, "Oh, and you will start the barn chores tomorrow so get ready to work. And be up by 7:00 in the morning." He smiled and nodded. Ashley then walked into her room and closed the door. Ashley knocked on Derek's door and said, "Breakfast is ready and it is past 7:00! Hurry up!" Derek hurried and opened the door all ready to go. "Why didn't you come down earlier?" Ashley asked. Derek shrugged as they walked downstairs together. After breakfast, everyone started on their chores. "You will be feeding the horses right now." Ashley told Derek. "And I will be watering them. Just tell me when you're done." She added. Then they both got to work. Soon they were all done with the chores in the morning because of all the help. "Dad, I'm going to try riding Stormy!" Ashley called while walking into the barn to tack him up. Ashley tacked up her beautiful blue roan Rocky Mountain Horse. "I have a feeling that you and I are going to be great friends." Ashley told her horse. Just then, she remembered her mom. "I hope she's okay, boy." Ashley said softly to Stormy. To Be Continued! PLEASE comment for more!! it is sooo my kind of story! Please a part 2! I love it! Please post a part 2!!! !